CT scan showing the massive tumor in Honesto’s sinus cavity. Specialised human surgery has been used successfully in a ground-breaking operation on a sinus tumor in a horse. For the veterinary team at UC Davis, it was the first ever image-guided sinus tumor removal. Honesto, a 6-year-old Lusitano-Arabian cross gelding, was found to have a massive sinus osteoma (a benign tumor created from new bone growth), discovered as a generalized swelling and enlargement of the bone and soft tissues below his right eye. 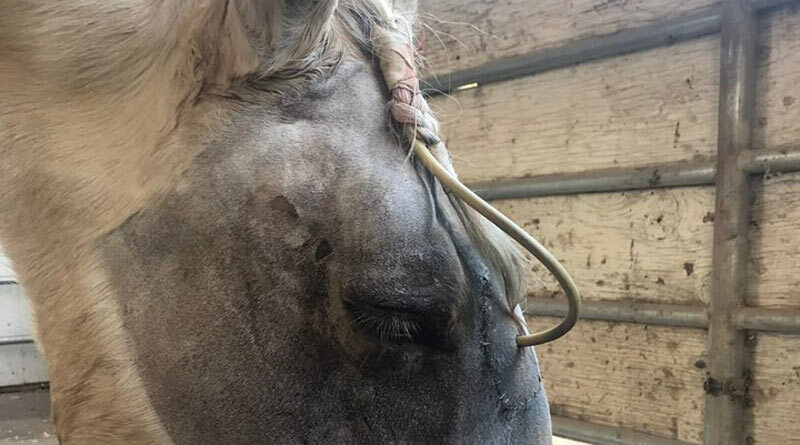 Radiographs and a CT scan taken at the UC Davis veterinary hospital revealed the mass was encroaching on his eye socket (causing consistent tearing) and blocking the right nasal cavity and numerous sinuses, including the frontal sinus, directly in front of the brain. To prevent the tumor from growing larger and injuring the eye and brain, a very delicate surgery was needed. Honesto’s tumor was first revealed in an X-ray. Dr Larry Galuppo, chief of the Equine Surgery and Lameness Service, explained these risks to Honesto’s owner, Angela Langen. As Langen decided how to proceed, she discussed the case with her close friend, George Domb, MD, an otolaryngologist (ear, nose and throat doctor) who specializes in human sinus surgery. Domb suggested a technique used in human medicine that has made extensive sinus cases safe. Using an image-guided navigation system, surgeons could operate on Honesto’s tumor while identifying the precise position of their surgical instruments on a CT scan at every moment. This procedure would allow the surgeons to avoid inadvertent entry into the brain and eye socket. Honesto recovering after successful surgery to remove his sinus tumor. Assisting the pair in the challenging surgery was second-year equine surgery resident Dr Tom Cullen. UC Davis’ equine surgery residency is one of the largest in the world, and routinely provides aspiring surgical specialists access to challenging cases like Honesto’s. Home care consisted of daily flushes of Honesto’s sinuses through a drainage tube that the surgical team left in place for this purpose. Home care for Langen consisted of daily flushes of Honesto’s sinuses through a drainage tube that the surgical team left in place. At Honesto’s one-week recheck appointment, Galuppo noted great progress and removed the sinus irrigation tube. At his two-week recheck, the skin staples were removed. Angela Langen is back to riding Honesto after UC Davis equine surgeons teamed with a physician to remove his sinus tumor. Domb and Galuppo plan to have further discussions about translating human sinus treatments to veterinary medicine.